Some well-meaning Redlands’ green thumbs are dumping their lawn clippings around the base of nearby trees, putting our veteran trees at risk of suffocation, disease and death. Redland City Council Mayor, Karen Williams said simple actions that we think might be helping can actually lead to the demise of our trees, and we want to maintain as many as we can. “Dumping garden waste in natural areas owned by Council is not only illegal, but can cause serious damage to our trees and native wildlife. 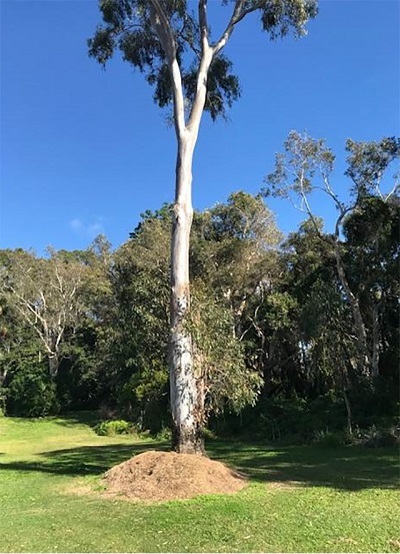 “Redlands already boasts a number of veteran trees for example, one in Redland Bay over 250 years old and another on Coochiemudlo Island over 600 years old, for which Heritage Listing is being sought. “And their usefulness doesn’t diminish as they age. Redlands Coast is known for being naturally wonderful and our trees are part of that attraction so I would encourage residents to consider other ways to dispose of their grass clippings so as not to put our local trees at risk. High value mulch material should be no higher than 100mm from the natural ground surface, with a gap left between the trunk and the mulch to allow air flow. Grass clippings also contain many thousands of grass seeds and cuttings that will grow wherever they are dumped, providing conditions are suitable. Most of these grasses are not native and can become bush invaders, or get washed into storm water drains causing blockages and further spreading unwanted weeds throughout Redlands. Instead, place grass clippings in a bag prior to disposal in your general waste bin (red lid), or place without a bag into a dedicated green waste bin (lime green lid). Do not blow grass clippings onto the streets as this can also lead to the spread of weeds along local waterways and is not a legal way of disposal. Waste transfer stations located in Birkdale, Redland Bay, and Coochiemudlo, Karragarra, Lamb, Macleay, North Stradbroke and Russell islands are free to residents (in vehicles weighing under 4.5 tonnes, including the waste) and will accept green waste.